Coaches, trainers, teachers from all walks of life, who want to build and sell online courses. Invanto platform makes building online business fun again. Easily build beautiful online courses, membership sites, training portals, and a lot more. Our business centralization suite is designed to provide an all-in-one solution to automate your businesses from one dashboard. Save time, scale your business, and create more freedom in life. Amazed at the number of affordable features, ease of use, interweaving of apps, & flexibility. Pros: Affordable. Flexible. Growing. Feature rich. The business owner and their end user are well-considered through out. It's clear Invanto did their homework and works hard to bring incredible value. I am grateful to have this suite of apps without investing money I don't have just to get started. Invanto is a newer company with an incredible suite of versatile & valuable offerings to help small businesses. They have clearly thought through a number of options that people like me might need. And they listen to feedback suggestions, while keeping an eye on business plan, which I admire. Their service has been great. By understanding it's a newer company, my expectations are set to watch them grow. The instructional videos on YouTube are a huge help too! Invanto makes it easy for thought leaders and entrepreneurs to get started quickly. Invanto is a newer company with an incredible suite of versatile & valuable offerings to help small businesses. Cons: Understanding whether to choose Membership Factory or CoachRack is a little tricky. There is a super helpful blog post to help you think through it. It would help to see a visual walk through from an end user's perspective for each app. Especially, with examples of how the apps could be used in different scenarios. This may be something users of similar sites are already familiar with, but I'm not. I like to see demos of sites, as a walkthrough or for testing purposes, so I can make the best decisions. Hopefully, this will happen in the future and I look forward to getting help via the forums or FB group. So, not really a con. Just something I personally find helpful. Overall, I LOVE LOVE LOVE Invanto and am extremely happy to have this option as an alternative to the expensive options out there. Great membership and course delivery software! Invanto has become the host for all of my products. Pros: Invanto has a beautiful interface and layout. The membership and course areas are easy to navigate and just make you look good to your customers. I love all of the features they have to offer right now and am excited for what they have coming down the pipeline. Their vision of being an all-in-one marketing platform had me on board instantly. They have become my new home for all of my courses and with their professional looking store front, it's easy for customers to look through and buy other courses I have to offer. I have made more sales since moving to Invanto than I have on any other platform and my customers love it! Cons: Because this is a newer software there are some bugs that are being worked through and lots of improvements being made. For example, at the time of this review, they do not have API integration set up, but it's coming down the pipeline. However, the team at Invanto is incredibly responsive and helpful. They quickly fix glitches that are found and are so open to feature requests. Including my nagging on getting the API integration done. They welcome their customer's feedback to help make the platform better. Which is good, because they are probably sick of hearing about me asking for the API integration and yet are still incredibly helpful and friendly. I understand that no software is perfect, so I'm patient because I see their quick growth, improvements and potential. Pros: It is easy to use. I was able to open it up and get started right away without reading anything. Building my course in Invanto was fast and easy. Time is money so you don't want to be wasting time trying to build a course, you want to stand your course up quickly and without a lot of frustration. Let me correct that, you want to stand your course up quickly without ANY frustration. It is constantly improving. Unlike our old platform which was static you get what they have Invanto is constantly improving. You and others in the Invanto community want a feature, tell Invanto and they get right on it and build it. Seriously, very few software companies are this responsive to their customers. Usually, you get what they build. In this case they build what you need. It is very professional. The end result is professional looking. When your reputation is on the line you can't have your platform look like a third-grader built it. You can't have it look like it was built back in the day before the mouse was a common computer tool. It must take advantage of all that new technology has to offer and Invanto does this very well. Cons: It could have a better help sections and videos on how to do things. I think they are busy constantly improving the software and forget to create help documentation. But, as I said in the Pros section it is pretty easy to figure out. Overall: Put our courses online quickly and easily. You can't make money if your product (courses) aren't available to customers. Do you need to get quick profits on your menbrake scheme? or create your own fully communicative learning professional structure and have mock tests? Or businesses that provide incentives through rewards? Or simply market all kinds of technology in a simple way? Cons: By its very nature, platforms like these are in constant development, overcoming failures and expanding the capabilities of the tools, in order to meet the needs of all its users, therefore, the tutorial videos or technical assistance in Real time, would allow people who are not related to this type of tools, to take full advantage of each of the possibilities offered by the platforms, fortunately, the support team, in a friendly and quick, manages to solve the doubts that may arise in the development of each of the business units. Never has launching a membership site been so easy! Pros: I love that the software makes organizing vast amounts of content simple and that I can take the tech development off my plate. When working with learners who aren't super tech savvy, it's especially important that the platform provides an intuitive learner experience. I have found Invanto to be great at this and with a few modifications that are in development, it's only going to get better! Cons: As with all growing tools, there are still kinks to work out. I dislike having each membership option on its own order link. It doesn't allow me the option of offering both annual and monthly memberships to the same buyer. I have also experienced issues with the static pages. They continually have issues. It's hard to troubleshoot. I also found the domain mapping to be difficult. I have tried multiple times without success. The support is phenomenal, however. The only other issue is the lack of guidance on the customization aspects. It would be a simple fix to include a guide that explained what all the color options would change, what picture dimensions to load, etc. Pros: You just have to log into ONE place and you can have access to all your online membership/learning/affiliate tools. For the longest time I was trying to find something like Invanto, but other platforms were always missing one or two things I needed, so glad I discovered this tool. Cons: The one thing I'm not a huge fan of is if you're a beginner at using the internet or even just like, not knowing what certain terms are, it can be difficult to set up. That being said, over time they have developed some great guides to read over for help. It was confusing as to what the differences were between Membership and Coachrank. Overall: I just launched my online learning store with it. After playing around with the each of the different apps/tools, it's become more intuitive to me and I feel a lot more confident in using it. The customer support is great too! Quick and easy way to get the job done! Pros: Love how easy it is to find the tools I need for my clients and implement them immediately. The problem is normally when I travel for work and am not in the same area as my clients. Cons: I wish there was a better way to have my clients buy software and share their login with me or give me admin access to their account. They need ownership I do not. I just need to work with the tools they provide me. Overall: My clients get a great product and it is simple for me to setup for them. A great experience, very powerful platform. Takes care of my course and membership needs. Pros: Have to say i enjoy using the invanto platform as it brings me an easy way to create and feed my courses and value content to my members. Its Very easy to add and edit courses. Has Good payment gateways. So is you go with this option you will not be dissapointed. The support is amazing and they have a very active facebook group. Your queries will not go unanswered. And theres plenty of support and good feedback from the founders. Cons: Minor issues like not having a reference for the optimal image size of hero and banner image. Takes a while to figure out on your own. It has examples and a course on building courses on the platform but i would like more of this kind of value. A better onboarding experience perhaps. Overall: Finally was able to launch my membership site. My clients are very happy. From membership platform to sales, the creation of courses, marketing, INVANTO offers this services! Pros: Crazy customer support, you can begin from the ground up even if your a newbie, there are complete tutorials and great customer support. Plus the site gives you inspiration in every page, simple quotes to keep you going. Cons: The site's color is too much on the light side, my preference is on the vivid side. The free trial gives so much value that you think twice if the premium will give more, and it does! Pros: I've been a customer of Invanto for about a year, and they are continually improving the platform, and are very repsponsive to customer suggestions, which I really like. Right now I'm using it for a publicity class I'm teaching, and in the next year or so, I'll be building out a membership site with the software. Cons: There has been a bit of a learning curve in getting it set up and working well, and there are still more features I'd like to see in regard to accepting free students, but not for a free class. (As in, if I have students who have paid for an in-person workshop, and I want to give them free access to what is otherwise a paid course, I have to jump through hoops to figure out how to make that work. But all in all, it looks like the platform is headed in the right direction. Overall: Allows me to easily upload course materials, and organize it for students, and handles back end work like accepting payment, email, etc. Invanto is a half-baked product and the owner is prone to break promises. Pros: The promise of several apps at one place working in symphony. Cons: We gotta know about Invanto platform in 7/2017 at AppSumo. The founder sounded extremely enthusiastic during the life time deal. He promised all future apps with all features would be available for 7/2017 AppSumo buyers. The only thing not available was Invanto whitelabel which was later made part of AppSumo BriefCase Pro plan. In a year that followed, he couldn't deliver a single functionality in a proper #polished# manner. Even the most basic features that he promised will #arrive in few months# have not seen the light of the day. Now it is 9/2018, he played a new trick and has reneged on all promises that were made an year back. Several basic features like Zapier , independent Testnia papers that he promised earlier were #arriving in few months# have been transitioned into a new #top-tier# that he created on the fly. The most disturbing thing is that he continued rehashing the entire year that Zapier and independent Testnia papers would arrive soon and you will be able to sell test papers. Now he arm-twisted all the life time deal owners to jump onto the new subscription based top-tier within 3 days or else risk to lose what he committed earlier. Tonnes of people were kicked out of his FB group when they protested against his decisions. On searching more about him we gotta know , he has thrown such antics in the past too with JVZoo/SiteManPro and has broken promises by not delivering the promised apps or by not paying commission to partners/affiliates. Overall: The Invanto platform as it stands today is half-baked. My strong recommendation is to stay clear of Invanto or any lucrative offer the owner tosses at you. I really like Invanto. They've got great customer service and are regularly adding new features. Cons: It still has a few issues; sometimes accounts expire despite being set up for lifetime access and people cannot manage their own payment details which is difficult when you run a thriving membership site. People need to be able to update their own card details. Overall: I get to have a fully functioning membership portal and course content portal that works. Amazing Value From Deep and The Team! Pros: I love the fact that it is such a complete toolkit for the digital entrepreneur. The founding team are real trailblazers and are 100% committed to customer service. Deep and his team are insanely ambitious and have successfully proved early doubters wrong by developing all three current apps at an insane pace! The Facebook community is thriving and is full of inspired, innovative helpful people! Cons: It can be slightly confusing and overcomplicated at times however Deep and the team work hard to support users via livechat, email and the Facebook support group. They have had some issues with infastructure but this is solely down to the fact that this platform has become really popular in an incredibly short space of time. Deep and the founding team work 24/7 to fix bugs and develop new features. The overall suite is still im development and waiting for the other modules to launch but if what i have seen so far it wiil be worth the wait. Serves its purpose very well. Product is designed greatly for online courses or membership sites. Pros: I like the ease of setting up online courses. We needed this type of a software to avoid development expense to create an online school. Invanto gave us the platform we need to create the online school with a premium membership site. Cons: Sometimes it does become overwhelming - you just have to take a step back and look at your process so it does not get confusing. Simple platform to use. Overall: Cost savings in platform development and maintenance. This company has great potential and it shows through the quality of the product. Pros: The potential. The dashboard housing what I need at my fingertips. The updates are frequent and the company keeps us abreast of updates. The various apps being built compliment each other. Cons: The lack of video tutorials, especially for the new apps or newly updated apps. We have to figure out how to use it. Part of the software are very user friendly while others require a higher technical skill without supporting tutorials. As yet I have not implemented use of this product while it's being developed to the point i need. Pros: The potential. I see a very good potential use of the product to further my business and that is why i bought it a while back. Soon these features will open up and i will be able to put together a complete package using only one piece of software/product and it is all kind of fool proofed so that even folks like me can use it without too much technical knowledge. The tutorials. They have not held back on tutorials (online) which you can watch. The development team tend to respond swiftly to the community. Cons: It is taking a long time to get exactly where i need it to be (others are using the current features and loving it). However, as more people sign up and as time goes by it is getting closer and closer so, i am being patient. Overall: It is soon going to be the entire platform for my latest business. I have already recommended it to others who can use the current features. It is also reasonably priced (very good) for what you get (and will get). Pros: Are you a teacher/ instructor/ educator? or do you need a membership platform where you can sell your courses? Invanto is an awesome platform which you can use to host your videos and create membership websites to help spread your course. Cons: It is still small and It is going to be big. There are quite a few bugs in the platform but the team behind Invanto solves the problems swiftly. Overall: They have many native apps which are going to get integrated with Invanto which will make them more valuable to use. With all inbuild features save me time and money. They have alot of options, very quickly to setup the course or training and go up and running. All my employees who take the training love it. Is a plataform you can use for sell course, give rewards or inhouse training. Cons: I dont like the student management system, (add/delete student) The admin ui could be better, sometimes is really hard to make simple stuff. A would like they add more process payment. Another silly issue, the url for the schools are insanly long so people forget the url. Overall: Time saving, and all in one. Great tool for online marketers! Pros: My staff enjoys the ease of use regarding course creation. Compared to most other alternatives, we've found that it offers the widest range of features for a reasonable cost. Cons: It is a bit complicated to learn, but its very intuitive once you get going. They could improve the various connections between modules; however this is on their roadmap, so its not a big deal. I use Invato only second to Amazon for things purchased on the net. Best place for WordPress. Pros: The best WordPress themes and theme authors can be found on Invanto. Every sing theme I've ever used for a site was bought on ThemeForrest. Cons: No real cons other than support licenses are time based - i.e. six or twelve months vs permanent. I find all of the pricing on Invanto fair but renewing support for multiple items can add up. Overall: The best place to shop for WordPress theme. Very well trusted. Pros: I like that this integrates LMS, with a membership portal, digital products, and a reward system. It offers a lot all in one place. I love the concept of the membership and classroom portal. I got it because it's something that I want to create for my business. I got it at a great price when it was first released. The pricing is affordable, and it allows for growth. Cons: I haven't gotten my head around how to set it up. It's still a fairly new program and they are adding to it and improving. I would say right out the box it's not exactly user friendly, but that is more of a personal thing. Having better tutorials would be a big help here. Otherwise I think this is great it's just what I needed formy business. It's a one stop shop for anyone who needs to set up an online membership or e-learning school ASAP! Pros: I like that once you log in to your account / dashboard, ALL of the apps are there at your fingertips and with very little webdev knowledge and some quick tutorials all of the apps are connected with each other - they integrate far more easily that attempting to create all of those connections manually or even worse - blindly through experimenting with apps out there from different companies. Cons: I think that the features are great, but they haven't been fully processed out all the details - in a way (at least to me) that makes for a 100% seamless and 0% frustrating experience, especially in the initial set up. If you are brand new to webdev or wordpress - you're likely going to struggle some in the set up and beginning ... but I do believe that the team is planning on continuing to expand their online knowledge base for users. Overall: The main benefit is that I can very quickly create a fully (or at least operationally viable) set up membership / e-learning site with most or nearly all the bells and whistles that other apps offer - but at a fraction of the cost and effort. I'm just starting out with a membership site and ongoing monthly group. This software is helping! Pros: The integrated nature of the software allowed me to take the next step in my business without panicking about how I would manage the technology piece. This allows me to focus more on my content which is what makes my offerings unique. It saves me time of having to figure out how to connect different applications that do only one piece of the project. (And eliminates my fear that I won't be able to do it!) Online training modules are also helpful for getting up and running. Cons: It's software and there's still a learning curve. However, Invanto makes that as easy as possible with their online academy. The Invanto Community is also a great place to find ways that others have solved problems and by looking at solutions get ideas for new ways to use the software. Overall: The most important benefit is the peace of mind knowing that the all the tools to run my courses and membership groups are in one place. I purchased this because I knew I'd be adding courses and because someone I trust recommended the software. These two things combined helped me know that I'd have the tools I'd need when I was ready to go live with my course and group! Pros: Simplicity. I liked the way everything falls into place. Also, there are plenty of helpful material that helps you start working and integrating right away. Cons: Variety. I would like if it had a variety to design. This may sound unnecessary but to marketers even the possibility to change colors on a font matters. It's so fast becoming core to my businsss. Sites and have courses drip fed ... it's full blown magic. Documentation isn't comprehensive enough and could Do with an update. As that was why it took me a while to launch initially. Though now that I have launched it all makes so much sense. Pros: It had promise to be a platform with every major feature needed for a business (memberships, courses, shopping cart, and more). But it never has lived up to its potential. Cons: Invanto always promises an epic list of new features but never delivers, or the the features don't work properly and the UI gets cluttered and confusing. What's worse is their constantly changing pricing and policies. They flip flop from saying they do not take any transaction fees and will then suddenly charge transaction fees. They've also offered lifetime deals, but don't honor their commitment and shut down accounts without notice. I've seen many people removed from their members Facebook group when they ask questions or make comments that management doesn't like. Honestly, stay far, far away. Overall: I have been in business for over 18 years and I've never dealt with such a poorly managed company. Bottom line: Choosing a platform can be a big decision that you stick with for a while, so be careful when choosing a company that constantly changes pricing and policies, and censors honest feedback from paying clients. I would never trust Invanto or its founder. That's also why I had to go anonymous for this review, but it is 100% the truth. It's made organising so much easier. Pros: I love the versatility. I can run a membership site, build a course etc. I'm looking forward to new features rolling out. Cons: What's not to like? It can be a little overwhelming to set up but with patience it becomes easier. I think it takes time and focus to learn. Pros: If you're looking to build your own digital membership or coaching website similar to Udemy or Teachable, this is a great platform so you have full control. The setup is a breeze and it walks you through step by step. I like the fact you can use your own domain and it integrates with Autoresponders. Cons: One drawback for me so far is that it hasn't integrated with Zapier yet. They did mention "thanks for suggestion as we plans to integrate Zapier really soon" on Dec 9, 2017 so hopefully it's coming soon. Overall: The biggest benefit is time to market. Not having to fiddle endlessly with WordPress or deal with a developer creating a custom solution is ideal. this does about 65% of what I had hoped for. Pros: Does the functions I need very well. I like the interface but had a significant amount of angst getting used to the workflow. These guys are very progressive and a little ahead of their competitors. Cons: Doesn't have three functions I was looking for. I find switching between the functionalities to be somewhat confusing. Overall: It provided a lot of functionality for services I was looking for. It also allowed me to grow my business on multiple fronts from one platform. Pros: Simplicity to upload, edit, and move the content, and how it's all in one place. I love the versatility of the formats that are supported. And how it also offers payment processing, payment plans, etc. Cons: The need to customize every element instead of simply copying what has already been created. I missed the ability to move things between coachrack and membership factory, or to integrate the two. It would be great to have a forum type of space for people to chat, collaborate (instead of using Facebook groups for that). Maybe a space to embed zoom chat to host classes within Invanto directly. Overall: A go-to place where I have all the material. Pros: It's simple, scalable and support is awesome. Love CoachRack where I can host my courses under one school. Cons: Customization to the School, Membership Site & Courses can be improved. It must be user friendly for newbies. Invanto has extremely ambitious goals, but they've been steadily meeting my expectations. Pros: It is an all-in-one solution that is easy to use. Nothing besides content is required from the user, and set-up takes almost no time at all. Cons: Because it is a new platform, the growing user-base places a strain on the hosting, so load times are sometimes slow. There are limited themes, something that is really holding a lot of people back. Overall: HUGE time saver and an all-in-one solution you can't find anywhere else. 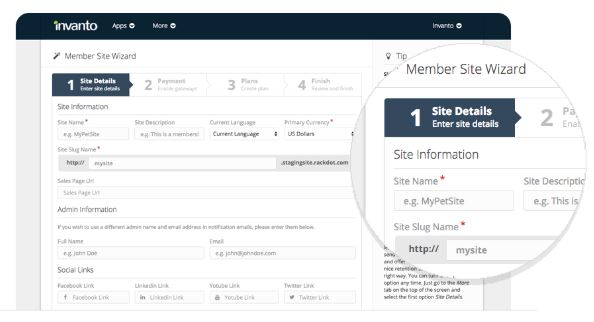 Pros: Invanto's MemberFactory makes it easy to create great-looking and feature-rich membership sites. It's good now and getting better every day. Pros: I like that with Invanto I have full control over my course from branding and pricing to payment gateways and templates. Cons: Invanto's vision is ambitious which is great. However, it is still undergoing massive development and some key features such as drip content in CoachRack, moving content between CoachRack and MemberFactory, and ClickFunnel-like bump/upsell/downsell offers in CartFog are not yet ready for prime time. Overall: I'll definitely recommend it more strongly once it's fully functional. Right now, my students are happily using the course I built on Invanto and that makes me happy. Cons: ... that's if the app can function properly. I have owned this app for a while now but I still not dare to make it a 100% of my 'Only' go-to. So what's stopping me? There are many bugs found and complaint has been lodged to the developer and yet the issue still persists even after a few months down the road. And yet developer keep coming up with new features while core component still not 100% functioning. Overall: Overall, it's not a very pleasant experience using this app as the founder has proven his mentally unstable by changing his promise back and forth numerous time. Today he says you will get 'all these' features in your package, and tomorrow you might receive an email from him threatening to shut down your account. I won't recommend anyone to put one of their most important assets in their online business in the hand of such a founder. Pros: Great value for your money. many different apps inside the software to create membership sites, online courses and much more. This is the only software I have seen to house so many useful apps for online creators. Cons: It's a new company and there are still many bugs to work out. Customer support is very responsive but there are daily bugs that need fixing every day. It's not as polished as some other options, but that's what you get with a new company. Overall: Great value for your money and a terrific all in one place for online creators. I love it! I dream about it. Pros: All I need to create my school in one place. I love it! All the team behind the scene is cleared that they know all we have to face to create a school and sell our knowledge. They have taken care of all the details. And it works for the spanish community! Overall: All I need in one place to create my school. I love it! It is still developing but in a good speed!!! :-) Sometimes I see some mistakes and things that dont going well but some months after they fixed it. I dont know but I am quite sure that this software will be a referente in the marketplace. Websites and courses are easy to design. Pros: The ability to build membership sites. As a WordPress user it was an easy transition to Invanto. The ability to build membership sites. As a WordPress user it was an easy transition to Invanto. The ability to build membership sites. As a WordPress user it was an easy transition to Invanto. Cons: The mobile version needs to be fixed. The site looks great on my desktop but on cell phone it does not adjust. I have a galaxy 6 phone. Also the load time is slow. Overall: None yet. I need the mobile version to be corrected before I'm comfortable showing clients. Pros: I love Invanto. I have 7 membership sites setup and they work great. So nice to not have to worry about plugins and billing. Cons: I think that some of the documentation could use additional explaining. I've had to ask some questions in the Facebook group to get clarification. Overall: The is so many. The most is not having to juggle plugins or worry about billing. Pros: This is exactly what I've needed to talk my business to the next level--Invanto is my one stop shop for much of business needs. The beginning learning curve does take some time, but the customer support is outstanding. I wish I could give this product 10 stars, it's that good! Cons: Cons? The only one I can think of is that they are constantly rolling out new features and applications in this phase of the Invanto business plan, I need to hustle to keep up right now. Pros: I love that it's all relatively easy to use and such a great 4-in-1 solution. Just set it all up and link your checkout page to your BUY IT NOW button on your landing page. I love the drip function in the MemberFactory, this is what a lot of other membership software charge for and I'm glad it's included. Cons: Some basic functionalities, for example, CartFog not being able to accept Paypal payments or that we aren't notified of a new customer joining our course, aren't there. Pros: The ease of use and all the integrated pieces, CoachRoack and Memberfactory. The product is also easy to navigate and setup payment plans. They just recently did something to make the sites extremely fast for end users as well. Cons: It is difficult to know the right sizes and specifications of the images to load, so it takes some time to get perfect, but once configured you don't have to touch those areas again. Overall: I can quickly upload videos and files and share them with my paid membership group. Pros: The fact that it has high aspirations and wants to create great tools for its users. You have a good community. Cons: That each of the tools is more like a "cheap" teachable or a "cheap" member site... I'm not convinced you will succeed on a real pricing model until users "love" using Invanto for any other reason that they got lifetime deal for a bargain price. What is unique about each individual app? How is Coachrack better than the competition? What is it's USP? Same for the other platforms. It's time to pivot and focus on each product being brilliant...and beautiful. I'm sorry but currently they are neither, but you do have this chance to re-focus. Look to Kyvio for inspiration. I know your product is targetting a different niche, but Kyvio stands out as a premium product with a USB - software for marketers made by marketers. But you guys are new - you have plenty of time. I see Invanto as a beta MVP currently. Pros: I like its simplicity, the software is convenient and easy to use. It makes designing websites a lot easier. Pros: Invanto is a relatively new company; but i see it's one with a lot of potential. I have used invanto for about 3 years now I love it. They are actively working on new features. Cons: - Customer service could use some work. With that being said i would recommend Invanto to others. Overall: It was a bit of a learning curve but once I got the hang of it; I was off creating membership sites and courses. I enjoy invanto and will stick with them. I used Invanto's member factory to monetize a course I am offering. It was easy to use. Pros: Ease of use was the biggest benefit. linking up to payment processor was painless and I was able to connect with both stripe and Paypal without any issues. Cons: The biggest downfall of this software is that it is not self hosted. While it is nice that they host all your content. There is a real risk to not hosting it yourself. What happens if Invanto is unable to make a go of it. All the time spent reating courses on this platform will be lost. Additionally, you are at their mercy in terms of your sites performance. Some members have voiced concerns regarding the slowness of their sites loading. I hate having no control over the speed of my users experience. To me this is a dealbreaker. I am nervous about whether Invanto will be around in the future. Has me looking at other options. Overall: Very easy to use and implement. Pros: Lots of features and the ability to customise your site. Lately, they've worked on the site speed a lot so it's super fast to load now for students. The team is pro-active in making updates and have delivered a lot in the last 6 months. Cons: Navigational experience can be improved. Currently, you have to go through a lot of steps before making any change. Also, previewing the course as a student is still hacky. Other than that, happy with the platform. My experience with Invanto has been wonderful. I love the transparency and the community too! Pros: I love the flexibility it gives me as an online educator. I have a membership site setup as a learning platform for my private clients and they have all giving positive feedback on using the platform to view training videos and content from me. Cons: There is much effort required right now to customize some pieces in order to stay on Brand. But I still enjoy learning the platform and I'm confident the Invanto team will improve these setting soon. So far what I've done has worked well. Pros: Overall ease to use but it doesn't provide some of the Intuity things that Teachable offers. Not a bad option to Teachable, as this is more affordable. I wish I could just upload instead of having to recreate from scratch. For what I saw, the platform is not as strong to monetize the courses. However, I will explore it again to see if new tools are available. I would love to use it - at the time I tried it, it seemed like a little too much work - but will explore again for sure. Cons: More intituative with menu options. More options for video creatio. Also, I would like to see templates that adapt to various situations - specifically as they relate to teaching and training - not necessarily as teaching online but more of teaching for teachers - if that makes any sense.